They’re grey. They’re for use on pneumatic tools. And they are sockets. Duo? I first heard about these from EricTheCarGuy. Grey Pneumatic is a company specializing in impact sockets. Their Grey Pneumatic are a cross between impact sockets and your traditional chrome sockets. They’re about the same thickness as a chrome socket but are designed to be able to be used with impact tools. 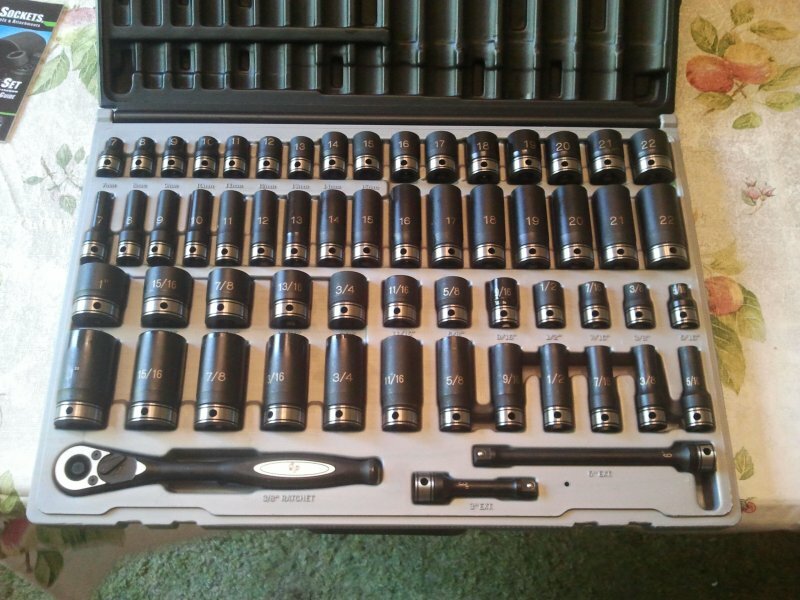 I got the 3/8″ drive set, shallow and deep, 7-22mm and 5/8-1″. It also came with two extensions and a ratchet. I had a couple reasons for getting it. I wanted an easy way to carry sockets to school, I wanted some fractional sockets for the rare times I’m not working on Asian cars, and the cordless electric tools I have are all 3/8″ drive. I use these just as much if not more than my 3/8″ Snap-On sockets. 10mm deep more than anything because so many things are held together with those bolts. I’ve used these on my cordless screwdriver, cordless impact gun, and cordless ratchet, and they’ve held up just fine. When my Snap-On flex head ratchet is in use already I usually grab this ratchet instead of my regular Snap-On ratchet because it has the quick release button. A cool design feature of the Grey Pneumatic ratchet is the quick-release button and the direction switch are inset flush with the rest of the tool, so they won’t get hit on anything as you use it. As seen in the picture, they come in a nice case, and the top can be removed to use the bottom as a tray to hold the sockets in your toolbox. This is a really nice feature, and I would’ve done that if I hadn’t wanted things to be more compact, which is why I built the socket racks seen in an earlier post. Grey Pneumatic sells Duo Socket sets in 1/4″, 3/8″, and 1/2″ drives, in fractional and metric, 6 and 12 point, and all sets come with a ratchet and extensions. The 1/4″ sets also come with a hand driver. Overall, I love these sockets. If I’d known about Grey Pneumatic before I bought my Snap-On, I probably would’ve only bought them. But I’m glad I didn’t, because there have been times I’ve had all four of my 3/8″ drive 10mm sockets out on various tools on one project. Five lug nut rating from me. This entry was posted in Tool Review and tagged Grey Pneumatic, Tools. Bookmark the permalink.